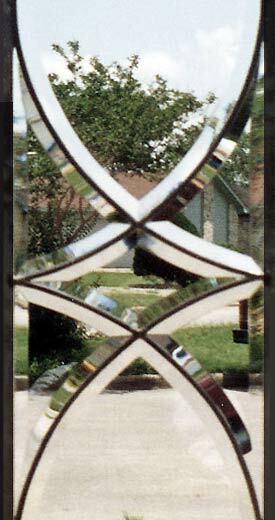 COLONIALSDBV Leaded Glass Sidelight Window All Beveled Custom Glass Design. "COLONIALSDBV" LEADED ALL–BEVELED GLASS COLONIAL STYLE VERTICAL SIDELIGHT WINDOW CUSTOM AT GLASS BY DESIGN. This custom Colonial style all–beveled sidelight window was 9" x 40", but since the beveling is custom, it can be most any size you need. This can also be used as a transom. The beveled glass to make this window was custom beveled to fit the space. The only color in this window is what the camera saw through the clear beveled glass.